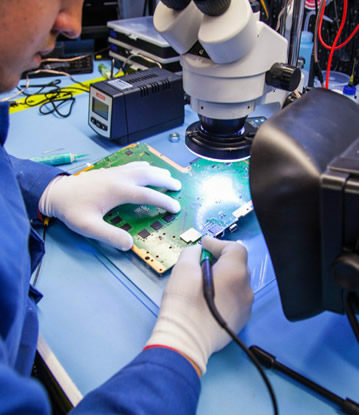 TekServe offers best-in-class reworking service to improve the condition of the defective products. Often products are not received in desired form; these are either faulty and/or are not manufactured as per their expectations. Rendering reworking service is highly recommended in such situations and TekServe excels in the task. We can rework the product and improve its condition to ensure the products are in perfect form. We have been serving the industry for the past two decades as a reworking services provider. Our fast and cost-efficient solutions improve the condition of the units to ensure we function per the demand. At TekServe, we have setup a modern testing facility where our expert testing engineers conduct stringent tests on each product to guarantee their quality and ensure that only a perfect product leave our premises. We have set high standards in the market and we strive to achieve them every time.Our dedicated teams of engineers work hard to complete the orders within the stipulated timeframe, which has helped us in gaining maximum client satisfaction.